Are you ready for Christmas? If that means do I have my Christmas tree up, my cookies baked, my presents purchased and wrapped, I am not. 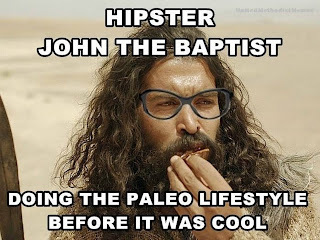 If that means dressing like John the baptizer in clothes made of camel's hair and eating locusts and wild honey, again, I am not. Are you ready for Christmas? Are you ready to show up for the nativity? Are you ready to be present for incarnation? Well, I'm getting there, but I'm not there yet. I still have some time. In the church we tell time differently than the world tells time. In the church, the beginning of the new year is the first Sunday of Advent. One of my favorite stories to tell with children is the story about how the church tells time. The church tells time differently than the way the calendar tells time. The mystery of Incarnation is so broad, and wide, and deep, we need some time and some space to prepare for it. It's not something we can jump into right away. When we tell time the church’s way and our year begins with the first Sunday of Advent, our year begins in quiet waiting rather than loud revelry. Telling time the church’s way causes us to stay awake and to prepare for this amazing thing that God does in Jesus Christ. Telling time the church’s way helps us to take time to be present to ourselves, to one another, and to God. Telling time the church’s way helps us to live fully alive, fully engaged. In Isaiah we hear that all of creation is getting ready, even the wilderness prepares the way of the Lord, every valley is lifted up, every mountain and hill are made low, everything is being rearranged for the day when we raise our voices and shout, Here is your God! And in second Peter, we are presented with another experience of time, one day with the Lord is like a thousand years and a thousand years are like one day. Advent not only marks the beginning of time, it also marks the beginning of the end of time. We begin the year again, we wait patiently for and prepare for birth, the coming of God into our world, and at the very same time, we wait patiently for and prepare for our Lord coming into our world again, the fulfillment of all things, as God promises. So our waiting and preparing and anticipating are for incarnation, for God with us, for Christmas, and all of that waiting and preparing and anticipating are also for all that God promises. And that, perhaps, is the key message of Advent. That in the stable at Bethlehem God is not only keeping promises God made to Israel but also making promises to us. That in Jesus, God hears our cries of fear and concern and doubt at our lowest points and responds. God hears our praises and thanksgivings and rejoices. And because of all of that, God is present right here and right now. And, my goodness, but the headlines seem full of low points. Our elected representatives behaving badly, people we see on our screens behaving badly. Gun violence is epidemic in our country. And here at Trinity, we try to be part of the high points, we try to be part of the solution, by being active with GIFTS, by giving of ourselves and our time and talent and treasure. And to the cries for deliverance, God responds with promises of healing, peace, and justice in and through the life, ministry, death, and resurrection of Jesus. What if God’s promises are not all something we wait patiently for until the end of time? Or, maybe more accurately, what if we are invited to participate here and now in the end of time promises of God by contributing to them in the present? What if part of how God keeps God’s promises is through our efforts to heal, comfort, help, and bring justice? I believe that is true. I believe that is true because of what God does in Jesus Christ. I believe that is true because of this inconceivable incarnation, this mystery of faith. I think John the baptizer knows something of these things. John's call to prepare the way for the Lord; to make his paths straight, is a call to us to recognize the impediments that are in the way to realizing God's promise, God's promise of love and mercy, compassion and justice. It is a call to turn around, to turn away from all that keeps us from love and mercy. It is a call for us to get on with the work that God calls us to do. I'm not sure what all of the impediments are that are in our way to God's promise of love and mercy, compassion and justice. But I think they may be big huge things like racism and bigotry and lack of concern for the environment and this planet we live on. But I think those impediments may be removed when we look into the eyes of the one who is across from us and we acknowledge their humanity. Those impediments are removed when we turn around, when we turn toward God. That brings us right back to the present. What kind of waiting do you want to do? How can you spend your time, energy, wealth, and lives making a difference right now? Because we are all called to cry out and prepare the way. It’s all of us. Right here, right now, waiting actively, if you will, by making a difference in the lives of the people God has put all around us. God is continuing the story of the good news of Jesus in and through our words and actions and each of us will have a hundred and one opportunities this very week to contribute to that sacred story, to make it come alive, to help God keep God’s promises here and now. Not that can bring ultimate healing or comfort or peace or justice. That’s God’s job, and God will keep God’s promises to the fullest in the fullness of time. But we don’t have to wait for that passively but are invited to throw ourselves into that venture both trusting God’s promises and living them right here, right now. This is the kind of active, involved, participatory waiting Advent invites. "To be hopeful in bad times is not just foolishly romantic. It is based on the fact that human history is a history not only of cruelty, but also compassion, sacrifice, courage, kindness. What we choose to emphasize in this complex history will determine our lives. If we see only the worst, it destroys our capacity to do something. If we remember those times and places -- and there are so many -- where people behaved magnificently, this gives us the energy to act, and at least the possibility of sending this spinning top of a world in a different direction. And if we do act, in however small a way, we don't have to wait for some grand utopian future. The future is an infinite succession of presents, and to live now as we think human beings should live, in defiance of all that is bad around us, is itself a marvelous victory." And why not get started now. There is no time like the present. Show the world that love indeed wins.